Use note: this collection is reserved for the use of researchers who have a need for using these maps in the course of serious research. The maps may only be used under the immediate supervision of a member of the professional archival / library staff of the Center of Southwest Studies. The Delaney Library also has (on compact accessible shelving) three bound volumes (27" x 21") of the Hayden Survey maps, and these volumes are accessible for research while the Delaney Library is open. We have provided digital image access to all of the black and white pages of this atlas; please follow the hyperlinks below to view those images. U.S. Geological and Geographical Survey of the Territories. These maps are an unbound one-volume set, a product of the U.S. Geological and Geographical Survey of the Territories. As noted on the legend on the table of contents page, "This atlas is composed of two series of maps: the first, of four sheets, on a scale of twelve miles to one inch, each covering the whole State of Colorado; the second, of twelve sheets (six topographical and six geological, of identical areas), on a scale of four miles to one inch, each sheet embracing two and one-half degrees of Longitude and one and one-quarter degrees of Latitude, the whole presenting the results of the field work of 1873, '74, '75 and '76, covering the entire State of Colorado and adjacent portions of Utah, Arizona and New Mexico. ... A statement of the method of geographical work, together with the mathematical basis, will be found in the Annual Report for 1876." Contents are topographic, geological and economic maps, and panoramic views. This set of maps has been assigned accession number 1965:10003 at the Center of Southwest Studies. Accession 1990:08004F: this has a label on the frontispiece, "With the compliments of the Secretary of the Interior." This has water stains on the edges: on the upper right corner and on the lower center (near the binding). One donated to the Durango Public Library from A. L. Kroeger, July 1951 (subsequently transferred to the Center). The pages of this one are very dirty, throughout. Another transferred from the Durango Public Library (also subsequently transferred to the Center). Half of each page of this one have been damaged by exposure to water (the stain is from the lower right hand corner up and over). Microfilm collection I 028, Hayden Survey records (U.S. federal Record Group 57.2.3) on microfilm. These records of the Geological and Geographical Survey of the Territories are filed at the center under National Archives publication #M 623 -- 21 rolls, in microfilm cabinet drawer 6.8 in the Delaney Library. See also this book in the Delaney Library at the Center of Southwest Studies: Catalogue and index of the publications of the Hayden, King, Powell, and Wheeler surveys / by L. F. Schmeckebier. Portland, Oregon : Northwest Books, published 1970 as a reprint of the 1904 edition that was published by the Department of the Interior as Bulletin no. 222 (Series G, Miscellaneous, 26) of the United States Geological Survey (call number QE75.B9 no. 222). Acquisition of this collection: This collection was acquired by gift in a single accession (1965:10003) in the fall of 1965. Processing information: This guide was produced by Todd Ellison, Certified Archivist, Center of Southwest Studies; last revised in December 2003. Initial data entry (July-August 2002) was by Robert Yazzie, student archival assistant at the Center. Listed by accession number plus the map's item number. Cartographer (corporate name): Geological Survey (U.S.) Height: 27" Width: 38"
The work of primary triangulation was carried out by J. T. Gardner, from 1873 to the autumn of 1875, and was completed by A. D. Wilson. In black and white. Scale: 12 miles = 1 inch. Map is in black and white, but the rivers and other drainages are accentuated in blue. Topography done by A. D. Wilson, G. R. Belcher, Henry Gannett, G. B. Chittenden, and S. B. Ladd. In black and white. Scale: 12 miles = 1 inch. Item Number: 1965:10003:A03 Date of map: 1877 Place of publication: Washington, D.C. In the legend different colors represent agriculture land, pastureland, pine forest, pinon pines and cedars, and quaking aspen groves, sage and bad lands. Different symbols represent coal lands, gold districts, and silver districts. White indicates areas above timberline. The preparation of the colored sheets was done by W. H. Holmes. In color. Scale: 12 miles = 1 inch. Item Number: 1965:10003:A04 Date of map: 1877 Place of publication: Washington, D.C. In the legend different colors represent geology of Colorado: quaternary, tertiary, post cretaceous, jura-trias, carboniferous, Silurian, metamorphic rocks, and eruptive rocks. The preparation of the colored sheets was done by W. H. Holmes. In color. Scale: 12 miles = 1 inch. S. B. Ladd, G. R. Belcher, H. Gannett, and G. B. Chittenden, topographical assistants. Part of a series of twelve maps (5-10) that can be joined together as one map. In black and white. Secant cone. 4 miles = 1 inch. S. B. Ladd, G. R. Belcher, H. Gannett, and G. B. Chittenden, topographical assistants. Part of a series of maps (maps 5-10) that can be joined together as one map. In black and white. Projection: secant cone. Scale: 4 miles = 1 inch. Title: Central Colorado Cartographer (corporate name): Geological Survey (U.S.) Height: 27" Width: 38"
S. B. Ladd, G. R. Belcher, H. Gannett and G. B. Chittenden, topographical assistants. Part of a series of maps (maps 5-10) that can be joined together as one map. In black and white. Projection: secant cone. Scale: 4 miles = 1 inch. Item Number: 1965:10003:A08 Date of map: 1877 Place of publication: Washington, D.C. Item Number: 1965:10003:A09 Date of map: 1877 Place of publication: Washington, D.C.
Henry Gannett and A. D. Wilson, topographical assistants. Part of a series of maps (maps 5-10) that can be joined together as on map. In black and white. Projection: secant cone. Scale: 4 miles = 1 inch. A. D. Wilson, topographical assistant. Part of a series of maps (5-10) that can be joined together as one map. In black and white. Projection: secant cone. Scale: 4 miles = 1 inch. Item Number: 1965:10003:A11 Date of map: 1877 Place of publication: Washington, D.C. Different colors represent geological formations that have been categorized into geological epochs and rock types. A. R. Marvine, A. C. Peale, F. M. Endlich and C. A. White, geological assistants. Map is a part of a series of maps (11-16) that can be joined into one map. In color. Projection: secant cone. Scale: 4 miles = 1 inch. Item Number: 1965:10003:A12 Date of map: 1877 Place of publication: Washington, D.C. Different colors represent geological formations that have been categorized into geological epochs and rock types. A. R. Marvine, A. C. Peale, and William H. Holmes, geological assistants. Map is a part of a series of maps (11-16) that can be joined into one map. In color. Projection: secant cone. Scale: 4 miles = 1 inch. Item Number: 1965:10003:A13 Date of map: 1877 Place of publication: Washington, D.C. Different colors represent geological formations that have been categorized into geological epochs and rock types. F. M. Endlich, A. C. Peale, and William H. Holmes, geological assistants. Map is a part of a series of maps (11-16) that can be joined into one map. In color. Projection: secant cone. Scale: 4 miles= 1 inch. Item Number: 1965:10003:A14 Date of map: 1877 Place of publication: Washington, D.C. Different colors represent geological formations that have been categorized into geological epochs and rock types. A. C. Peale and William H. Holmes, geological assistants. Map is a part of a series of maps (11-16) that can be joined into one map. In color. Projection: secant cone. Scale: 4 miles = 1 inch. Item Number: 1965:10003:A15 Date of map: 1877 Place of publication: Washington, D.C. Different colors represent geological formations that have been categorized into geological epochs and rock types. William H. Holmes and F. M. Endlich, geological assistants. Map is a part of a series of maps (11-16) that can be joined into one map. In color. Projection: secant cone. Scale: 4 miles = 1 inch. Item Number: 1965:10003:A16 Date of map: 1877 Place of publication: Washington, D.C. Different colors represent geological formations that have been categorized into geological epochs and rock types. F. M. Endlich, geological assistant. Map is a part of a series of maps (11-16) that can be joined into one map. In color. Projection: secant cone. Scale: 4 miles = 1 inch. Item Number: 1965:10003:A17 Date of map: 1877 Place of publication: Washington, D.C.
Map divided into sections for maps 11,14, and 15. Different colors represent geological formations that have been categorized into geological epochs and rock types. In color. Item Number: 1965:10003:A18 Date of map: 1877 Place of publication: Washington, D.C.
Map divided into sections for maps 12, 13, and 16. Different colors represent geological formations that have been categorized into geological epochs and rock types. In color. 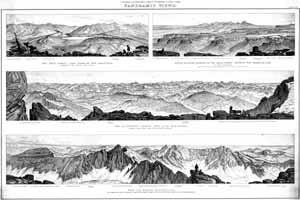 Drawings of specific Colorado mountain ranges which include: on top the Pike’s Peak group, in the middle view of the Swatch range, and on the bottom the central portion of the Elk Mountains. In black and white. 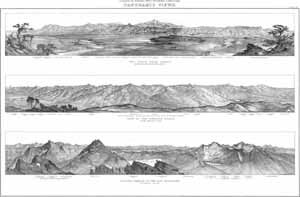 Drawing of specific Colorado mountain ranges which include: on the top left the Twin Lakes- Lake Fork of the Arkansas (showing the Great Moraines), in the top right southwestern border of the Mesa Verde showing the Sierra el Late, in the middle the Quartzite group - San Juan mountains. In black and white. Doing your own research: This description of a portion of the collections at the Fort Lewis College Center of Southwest Studies is provided to inform interested parties about the nature and depth of the repository's collections. It cannot serve as a substitute for a visit to the repository for those with substantial research interests in the collections. These collections are located at the Center of Southwest Studies on the campus of Fort Lewis College. Researchers wanting more information about using this material at the Center may email the archivist at archives@fortlewis.edu or click here to use our E-mail Reference Request Form (or phone the archivist at 970/247-7126). The Center does not have a budget for outgoing long-distance phone calls to answer reference requests, so please email if you wish to receive a response from the Center. To request reproductions of any of these images, click here for instructions.